The thing about writing a review is that it does set an expectation for constructive criticism. So while I enjoyed the two films and applaud the entire Krea team for treating us to their creations, I gotta do what I gotta do. Sunset struck home, it was very easy to identify with the story. The complex bond that marriage is- made of respect, love, banter, sharing, bartering, bargaining; pickled into an steadily thumping undercurrent by ages of being together- was instantly brought to life by TAR’s sensitive dialoges, aptly ‘un’-acted by Mama as Mithran and Geetha as Lakshmi. It was a great start to the film. Mama was the typical mama in India (characterized by an ease, a sense of belonging), the typical taata to his grandson, typical older NRI walking along somewhere in the Bay area (characterized by a reserve in demeanor), and the I-don’t-want-to-interfere-in-your-lives attitude that parents adopt when living with their grown children in their homes. It was a seamless portrayal by a green actor, superb. The penny-drop moment however was not the end, it was the stilted nature of the three adults in the 2 minutes of screen time they shared- Sukanya playing Ashoks’s wife, Naveen as Ashok, and Mama, as they sit down to dinner. It was in sharp contrast to the emotionally charged warmth created by other scenes, and spoke volumes about the change in Mama’s life. We get a glimpse of the formality underlying the relationships, a void one could cut through; Sukanya’s asking her father-in-law for chapathis; Naveen is just coming to grips with what it means to be a family man, which the senior Mr. Mithran almost chokes on. That scene could very easily have been overdone, but it was not. Kudos to the director on this one, and in general, to maintain a tight reign on the acting. The art department did a good job on recreating an Indian room as well. That said, let’s talk about the got-chas: Mark’s dialog was very Indian. An American could perhaps meet with such a twist in his life, but his choice of words would be different. Also, I agree with one comment made after the screening, the sunset should have been shown. A big got-cha; Krea definitely needs to work harder on the carry-forward association of ideas in successive scenes- There were illusions of flashback, even though it was all in the present time. For example, Mrs. Mithran passing away merited at least a photo with a garland in the next scene- How is the audience to know that she was not at the hospital for just an observation like Mithran said, that what one just saw was not flashback? Also, not sure why the sun was lighting Mama’s eyes as he slept- for a few seconds, it made one feel like the next scene was a dream. Good-bye was more a blank canvas for Vidhya Subramanian (playing the lead as Sudha) than a fully conceptualized film. There was no story, and unlike in Krea’s earlier stage- production- Rabbit Hole, there was no sensitive portrayal of family members trying to cope. Indeed, the film could easily be a monologue. Dheepa, as the director, should have insisted on TAR ‘finishing’ his characters and dialog. There were flashes of brilliance, like Sudha suggesting that she could just as well jump off the Golden Gate Bridge or planning the death-shower, so there is potential there. Perhaps TAR and Dheepa should work on building depth and consistency in the script before filming. Sure, it was an experimental project, but hey, you are sending this film to be judged around the world. Vidhya continues to be watchable, but one is already tired of watching her cry or suffer. We get it, she can act sad. It will be nice to see her with a multi-faceted character or situations the next time. It did get me thinking though that perhaps instead of a lead, Vidhya should do a cameo instead. Aruna’s 2 seconds of screen time as the distraught relative/ friend of Sudha was spellbinding. Sukanya’s body-language in her 2 seconds instantly made one cringe for Mama. Interestingly, in Rabbit Hole too, Sukanya had connected with the audience in the instant she came onto the stage. Her body-language, costume, style, everything is illuminating at the get-go. By contrast, Vidhya flings her net out to the audience slowly, both while dancing and acting. In Goodbye, her body-language is aloof, non-committal even, till the scene where she holds on to the sink for support when hearing the voice-message. However, the audio quality was so bad during the playback of the voice-message, one missed what it was about. Did the doctor actually impart bad news? Or did she simply say the reports were in- If so, then Vidhya perhaps over-reacted? Even so, that gesture was the highlight of the film. The characters of the husband and daughter needed some screen-time, or else they shouldn’t have been introduced at all. Even a single scene would have sufficed. Or, instead of showing Sudha’s coping physically, we could easily have been given a glimpse into how she was coping mentally. Some private moments of her coming to grips with her imminent departure…one does not finish with the coping when one first hears bad news, the grief comes in waves. Also, the Carnatic refrain at the start was perhaps in Asha Ramesh’s voice? Or was the audio quality poor? It didn’t seem like Vidhya was singing at all. To sum up, both films were held together by the lead-actors, with sometimes being uplifted, and at other times with no support from, the script. For her next project, Dheepa must not settle for flashes of brilliance, rather, should get immersive, and prod/ cajole /inspire / threaten her script-writer to make the characters live and breathe on an even flow. And TAR, tease those flashes of brilliance into a stream of consciousness! 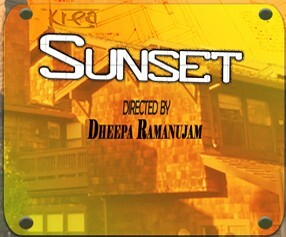 My rating: Sunset – 3 stars out of 5; Goodbye – 1.5 stars out of 5. Lehkikaa is the pseudonym of a member of the Bay Area community involved in the performing arts. She can be reached at lehkikaa@gmail.com and looks forward to your comments and feedback. This entry was posted in Movie Review on January 7, 2009 by vpdot.